It was honored for our company to meet Smt. 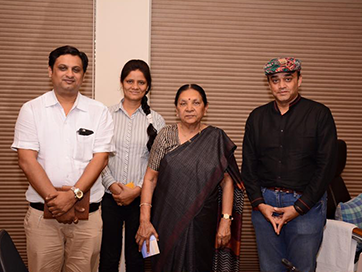 Anandiben Patel, the Chief Minister of Gujarat, regarding the launch of www.yogaahmedabad.com, a website that developed from our team, for the occasion of International Day of Yoga that is celebrated annually on June 21. On 10th June 2015, she launched the website http://yogaahmedabad.com. Our entire team worked extremely hard to get this project executed in a short span of time and our team did it by making this website exceptional. Cheers to our entire team, who worked on this project!